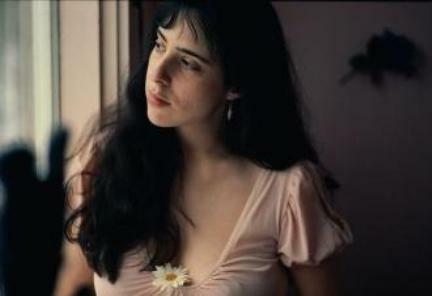 Tonight (Saturday April 14, 2012), Laura Nyro will be posthumously inducted into the Rock and Roll Hall of Fame. On the occasion of her induction, I would like to ruminate on one of my very favourite artists and her career, and jump into the middle of my series to a magic concert I saw Nyro give in Toronto, on a hot July night in 1989. There was something about that name …. it was flagged into my consciousness. Perhaps it was that “Nyro” sounded exotic. Perhaps it was that you didn’t see many female names as a solo songwriting credit in those days. 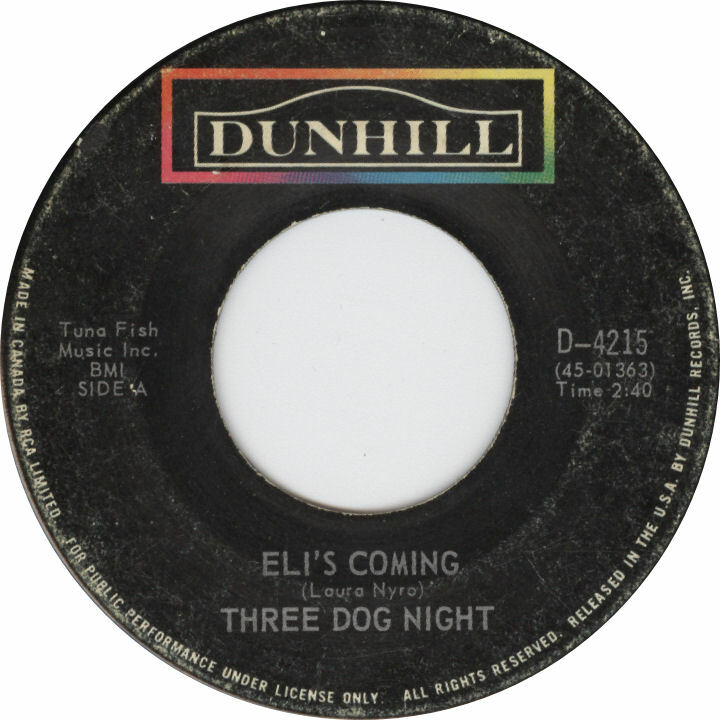 I was thrilled to realize I still had this: my sister’s 45 of Three Dog Night’s 1969 hit version of Nyro’s “Eli’s Coming.” Note they added a “g” to “Comin’,” probably to soften the title (All label scans by VA). In short order, I learned that she had penned a series of recent big pop numbers. The 5th Dimension became the most successful commercial vehicle for her songcraft via chart-bothering, sugared-up renditions of “Stoned Soul Picnic,” “Wedding Bell Blues,” “Sweet Blindness,” and “Save the Country.” There was also La Babs scoring her first big “modern” hit single with “Stoney End,” Blood, Sweat and Tears’ dramatic, bombastic take on “And When I Die,” and, of course, Three Dog Night (Todd Rundgren, Elton John, Elvis Costello, Joni Mitchell, Rickie Lee Jones, Alice Cooper (?! ), and many others have talked about the impact that Nyro’s music had on their own). These songs contained melodic motifs that I recognized and liked, even if I wasn’t normally a fan of the artist covering the tune. I was still a kid at the time and, therefore, wouldn’t have been parsing out the auteur-isms in these tunes analytically so much as intuitively, picking up on those aesthetic elements that consistently appealed to me. Even under the gloss, it was still there: that Pagan Soul. “Wedding Bell Blues,” later a US No. 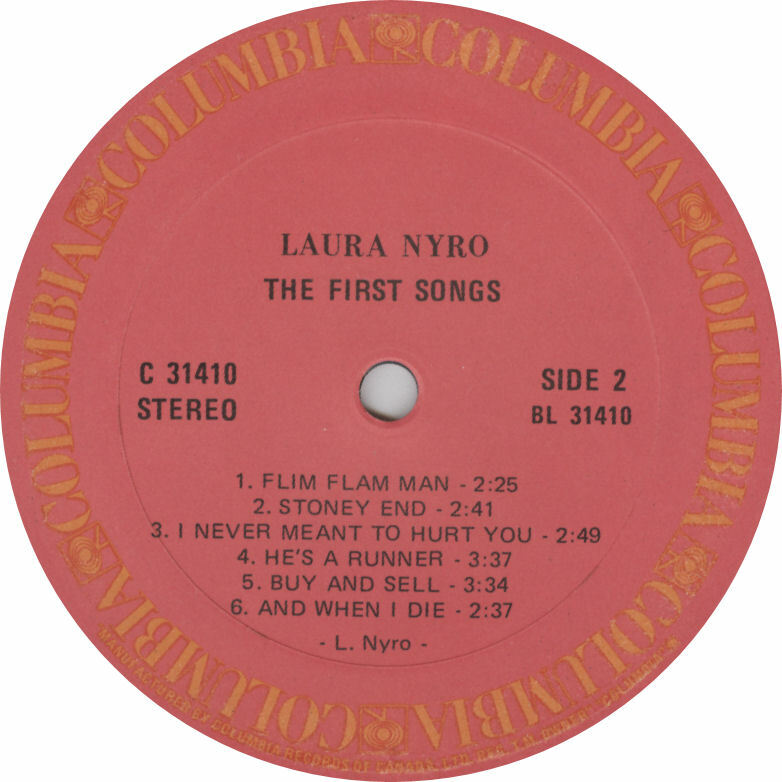 1 hit for The 5th Dimension, from Nyro’s first album, More Than A New Discovery (later reissued as The First Songs). Over time, I started reading about her: the eccentricities; the acid trips; her sensitive nature; her (supposedly) poorly received set at Monterey Pop; her communicating with musicians through colours rather than words; her early retirement, marriage, motherhood, and divorce; and then, later, the mid-‘70s comeback and the long, purportedly happy relationship with painter Maria Desiderio. I began noticing her own albums in the shops. She cut quite a visual figure, with the whole ethereal, gothic, menacing, hippy-gypsy earth mother trip, embodying a dark velvet twilight tone. But I never owned it until I got a copy from my friend, Special Guests, in 1984. Overall, I enjoyed and played the cassette frequently. But it was the two-part, eponymously named closing track that most grabbed me, beginning with one of the album’s most beguiling melodies before segueing into its free-form coda: an impressionistic, abstract koto-fest. I didn’t yet know that this track was the clearest link to the earlier, weirder Nyro in her prime, and that Smile was the album that marked a far less ambitious and super-charged approach to music for her. I hadn’t really had “The Full Nyro.” Yet. Mid-’70s Mellow (& ’80s too): Smile (1976), Season of Lights, In Concert (1977), Nested (1978), and Mother’s Spiritual (1984). That happened about a year later. I was an assistant manager at a West London, Ontario “XYZ Records,” and came across a budget-line cassette copy of Eli and the Thirteenth Confession, from 1968. I put the purchase on when I got into my car, and: Wow! And that was that. The impact was instant. It’s when you recognize that thing, and you realize you’ve been co-existing all along … and finally the twain meets. I spent the rest of the decade tracking down the remainder of her then-hard-to-find catalogue. Probably a month hasn’t gone by since where I haven’t played at least one Nyro song. A few dollars well spent: my cassette copy of Eli and the Thirteenth Confession. I also discovered that we had most of her albums at the radio station where I’d started DJ’ing in 1984, and I began regularly featuring her music on my show. Each week during my shift, I would present an hour-long special recapping an artist’s career, discussing the related key events/info, reading from magazine interviews etc., in between spinning highlights from their catalogue. I did a couple of Nyro specials during my years there, and each time received calls from listeners who’d had no idea that one person had written this whole group of songs — and how much more interesting the originals were. Indeed, hearing her compositions directly from the source and via her own stubborn, brilliant artistry was akin to hearing Little Richard after years of Pat Boone. While some of the covers make for great pop — especially those by the 5th Dimension — I infinitely prefer her passionate, hysteria-to-silence-arc psychodramas, with her voice scaling endorphin highs and then swooping down into long-sustained single sullen syllables. Yet, her material was portable. 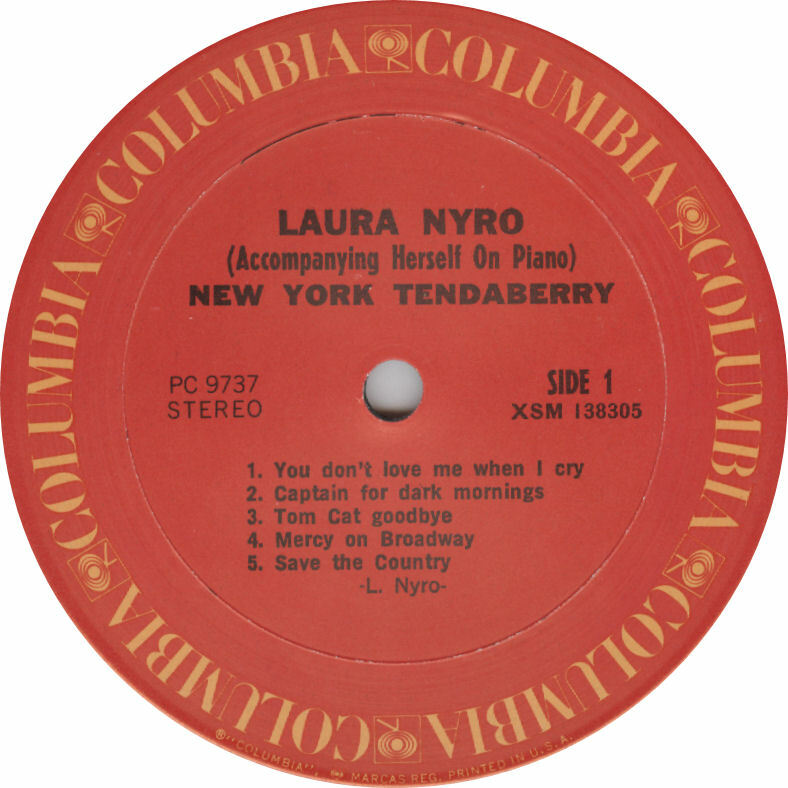 Laura possessed effortless melodic skills, and had a strong grasp on songwriting history, drawing inspiration from more classic sources such as Broadway, Brill Building Pop, and Tin Pan Alley, all clearly reflected in her body of work and informing her grander gestures. Also front-and-centre were the earthier influences of Soul/R&B, Motown, the Girl Groups, Doo-Wop, Gospel, Folk, and her own teenage nights spent singing on Bronx street corners with friends. There’s Jazz too, and the Avant-Garde, and the more offbeat Classical composers, such as Ravel and Debussy. They’re all ebbing and flowing at the party. At its most potent, her music is a hypnotic synthesis of, and battle between, forces of light and darkness, with neither grabbing the crown for long — particularly light. Nyro at her finest comes off a bit like a melding of Martha Reeves and Barbra Streisand, paired with Bacharach/David or Goffin/King, undertaking a musical project with Alice Coltrane. 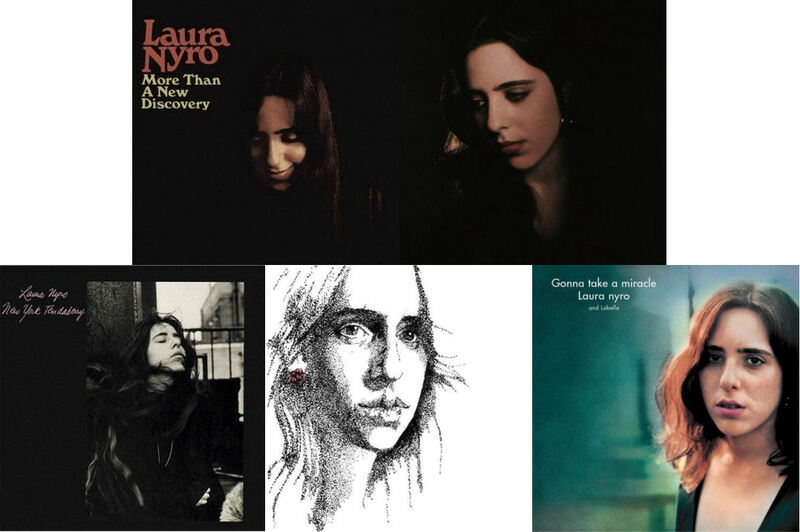 I’ve always felt that, aesthetically if not musically, what Patti Smith was to the mid-’70s, Laura Nyro had been to the late ’60s. Then there are her lyrics: dark, sometimes elliptical or surrealistic poetic reports on an enticing/repelling urban dystopia, with dazed desperation and hard, high times as part of daily living. In later years she shifted towards hazy peans to lives of laid-back agrarian contentment, yet these sometimes overly light-musically releases also explored feminist and environmental themes. While there are some great moments on the latter albums, I admit I prefer The Personal Nyro to The Topical Nyro. I was surprised to discover when I read Tom King’s David Geffen tome, The Operator (Geffen was Nyro’s early manager and his first cause célèbe in the Industry), that her early lyrics were often largely autobiographical. Case in point: my favourite Nyro tune, the harrowing “Poverty Train.” I had assumed that a lot of the lyrics in those early songs were observational character sketches and fictional interior monologues. Nope. She was living a pretty heavy life in turn-of-the-’70s Hell’s Kitchen. My favourite Nyro song, “Poverty Train,” performed live at the Monterey Pop festival in 1967. The legend goes that she was booed off the stage at this important showcase gig, destroying her in the process. This video bears out something quite different. I have since read that a more accurate interpretation of events is that the highly-sensitive Nyro merely perceived that people were booing and recacted badly afterwards on that assumption. Finally, there is her voice, a stunning, singular instrument of some range — and a good part of what kept her own performances off the charts in contrast to the more commercial, vanilla interpretations. It vacillates from barely audible whispers to fever-dream reveries and nightmares: possessed, exuberant, undone. Her first five albums, released between 1967-1971, are the essential core of her output and artistic reputation. 1967’s More Than A New Discovery (later reissued as The First Songs) had an accessible pop sound she never liked (I think it works beautifully), while her 1968 Columbia debut, Eli and the Thirteenth Confession, perfected her trade-mark sound (it was also one of my 15 Favourite Albums). 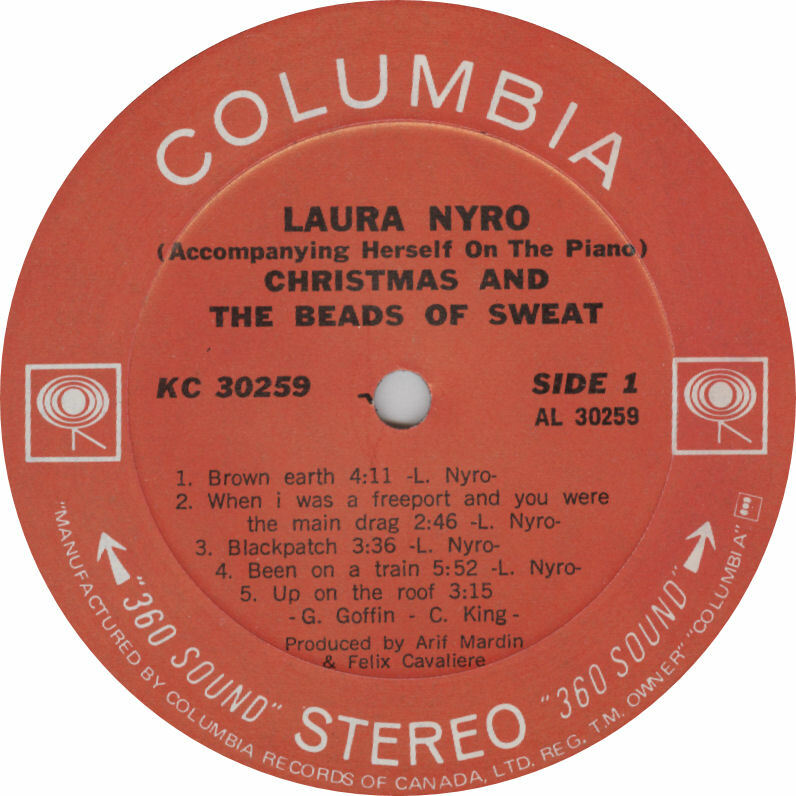 She would take Eli‘s approach to its dense peak on 1969’s New York Tendaberry, her dark valentine to her hometown, and then into alternately mellow and improvisational avenues on 1970’s Christmas and the Beads of Sweat. 1971’s Gamble & Huff-produced collaboration with Labelle, Gonna Take A Miracle, was a breathless love letter to the vocal favourites from her youth, and is one of the few “tribute” albums that truly works on its own merit. And then it was retirement and a low-key marriage out of the spotlight to a carpenter. The core, essential, first five albums: More Than A New Discovery/The First Songs (1967), Eli and the Thirteenth Confession (1968), New York Tendaberry (1969), Christmas and the Beads of Sweat (1970), and Gonna Take A Miracle with Labelle (1971). But some of that erasure, especially in light of how long it has taken her to be admitted to the Rock and Roll Hall of Fame, is probably also down to that, while Nyro’s music houses and synergizes many different styles, “rock music” itself barely registers as an ingredient among all the genres I discussed earlier. It’s rock music more in attitude than execution, leaving Nyro an uncomfortable fit for “rock icon” status. Nyro became an increasingly stronger presence in my music-listening life as the ‘80s moved along. So, the announcement of this neatly timed Toronto date was an occasion of much rejoicing by me. However, this Saturday began focusing on a totally different concert: The Rolling Stones upcoming September show at CNE Stadium, their first trip to Toronto in close to a decade via their Steel Wheels tour. I was up with the roosters to stand in a ticket line-up, sucking back coffee in the morning sun, my eyeballs on my cheeks behind dark sunglasses. A good friend of mine from the period, who I’ll call Keith Garcia-Westerberg (after Richards, Jerry, and Paul — he’ll be popping up in this series often between 1988-1990), was a Stones FANATIC at that time, and they were one of the things we had bonded over. He was a fellow music nut who, having recently relocated to Southwestern Ontario for school from remote, northern Ontario as well as being younger than me, meant that he was only now finally getting to see some of the live acts he had dreamed about while up near the Manitoba border. And the Stones were who he wanted to see most of all. When word came to him via a radio announcement — back in a world largely cell phone and Internet-free — that bracelets for the Stones’ Toronto concert tickets were to go on sale at noon, he hoodwinked a later-perturbed co-worker into hurriedly rushing him downtown to deal with a time-sensitive “emergency.” Once there, the not-amused impromptu taxi service was also reluctantly roped into line to collect a second bracelet, for two tickets each. 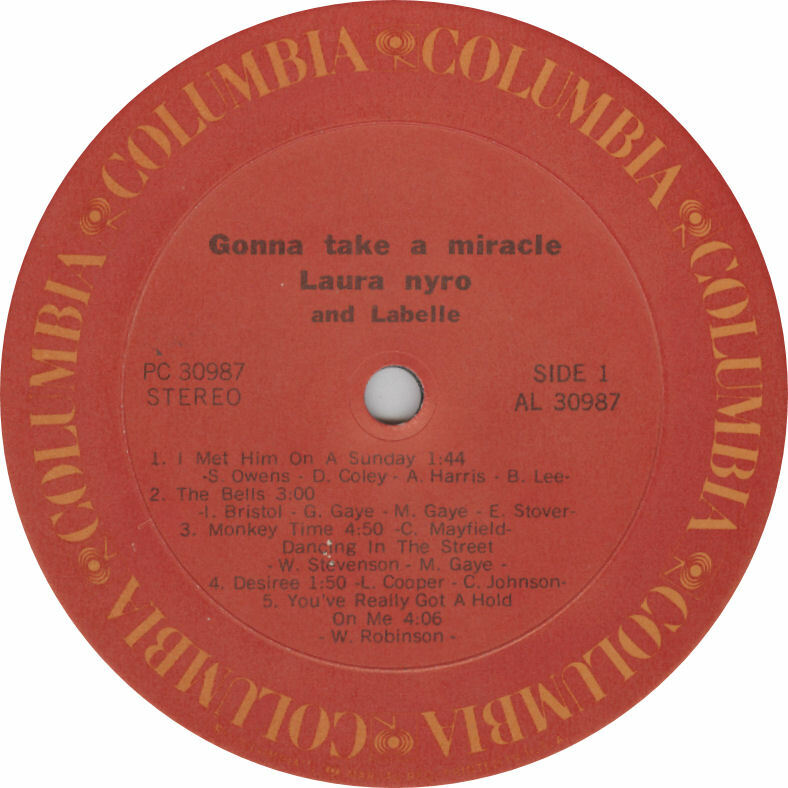 Major Lance’s “Monkey Time” and Martha and the Vandellas “Dancing In the Street,” from Gonna Take A Miracle, with Labelle (1971). 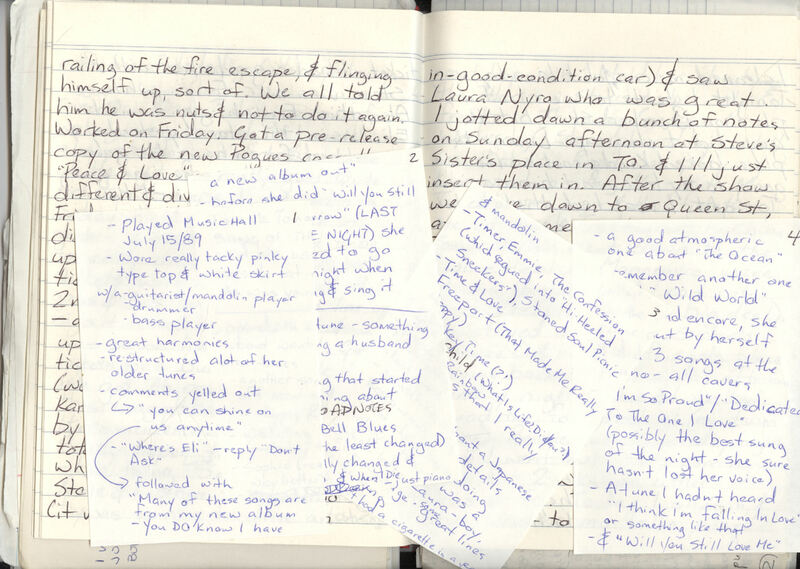 Notes that I jotted down the next day about the concert, along with my notebook from the period, where I write about seeing Nyro (and about writing the notes). The person in the lineup behind us turned out to be “Marianne Pallenberg” (as in Faithfull and Anita), who’ll also be showing up during the mid-to-late 1980s, as will her boyfriend during that time and one of my best friends of the period, “Jimmy Richards” (as in Page and Keith — I’ve already introduced him over on Open Salon via my piece on the Christmas robberies and Christian defections I had to deal with through a very un-merry December 1986). Keith G-W and I had seen Keith Richards and the X-Pensive Winos put on a to-die-for show the previous December at The Fox Theater in Detroit, and we were now pretty stoked about getting to see the finally reunited Rolling Stones. Keith had worked himself up into a right state about wanting to get great seats for the Stones (“he was totally hyper throughout the whole thing”) and that, combined with having to have gotten up early for a weekend, left Keith feeling a little drained. He had already agreed to come and see Nyro with me, but come Saturday morning, he was trying to talk his way out of coming on the Toronto trek for that night. He wasn’t overly familiar with Nyro’s music and pleaded exhaustion, but I managed to talk him back on board … and away we went in my Pontiac for one of many trips to Toronto during 1989. Among the reasons I didn’t want him backing out is that we were slated to crash at his sister’s apartment that night, and I didn’t want to have to drive back to London after the show (i.e., I wanted to hit the bars afterwards, ending up at the Rivoli for Heimlich Maneuver). We did indeed end up staying at her place, and on the following Sunday afternoon while still there, I jotted down four pocket-sized notepad pages-worth of recollections of the previous night’s stunning gig. Nyro had recently returned to live performances after a long, mothering-focused layoff. 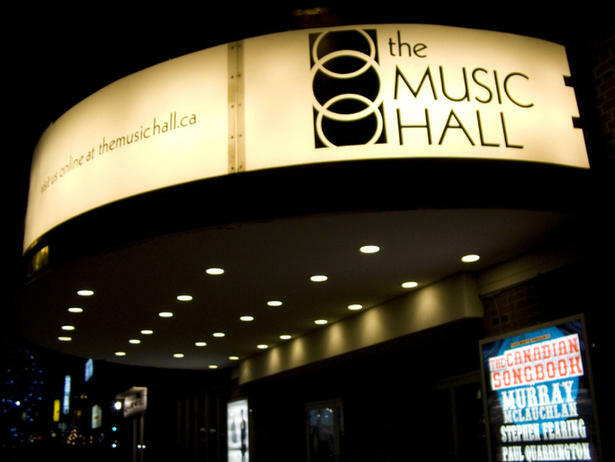 To the best of my knowledge, this gig at the Music Hall was her first Toronto show since the Smile tour in ‘76. This former vaudeville theatre was the perfect, intimate venue: no bad seats in the house, with the two of us sitting stage left, just a few rows back. 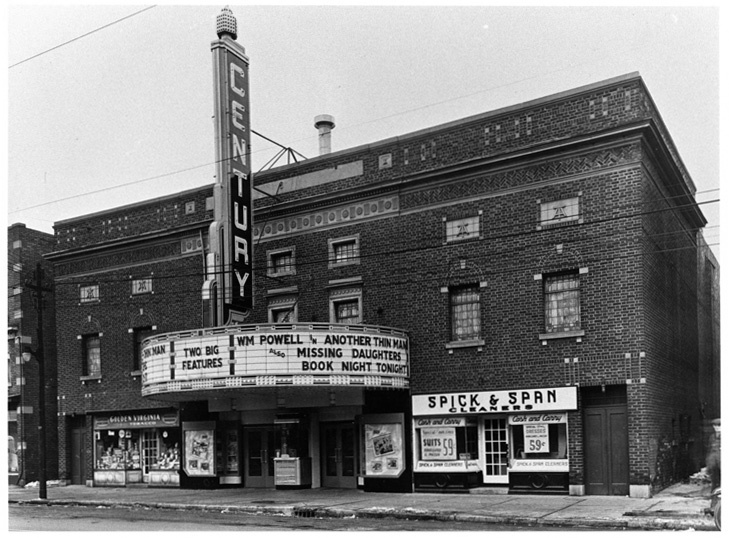 The Music Hall Theatre in Toronto in 1939 as the Century Theatre (above, from the Silent Toronto blog) and in 2004 (below, Wikipedia) and . And then she appeared, walking out to a reverential, rapturous, rapacious response from the filled-theatre faithful. As live Nyro performances had been scarce to non-existent for a decade and half, there was a real sense of occasion to this night. Intensity is often heightened when you are seeing an act where one is pretty damn sure that this will be will be the only time to see them perform in the flesh. The as-in-a-dream audience soaked up every minute, while Laura seemed truly happy and recharged about performing live. 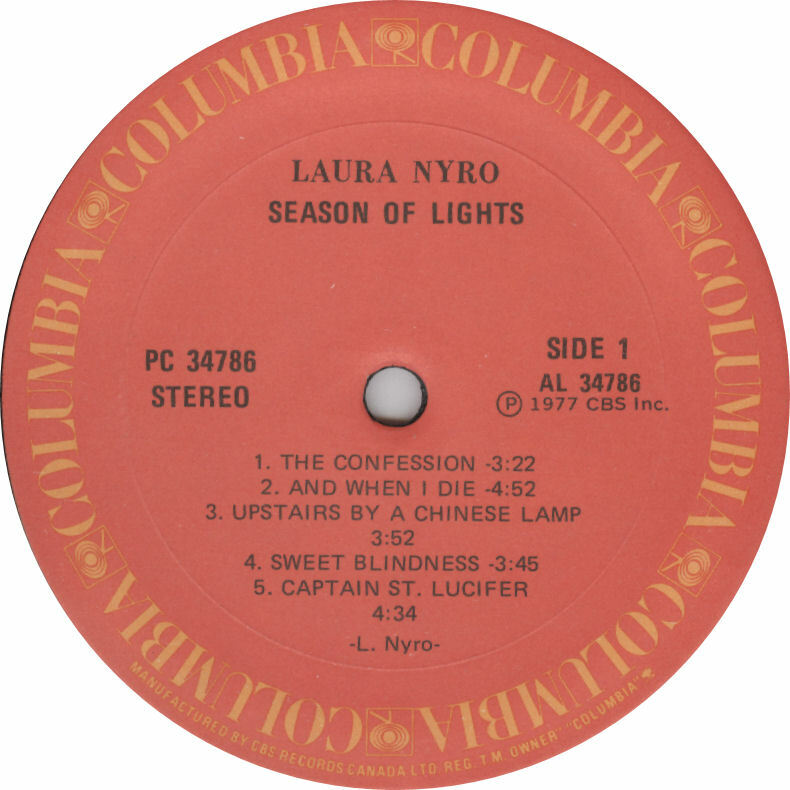 That album in question was Laura Nyro at the Bottom Line, recorded during her 1988 return to the stage and famed NYC venue, released a few months after this concert. If you listen to the Bottom Line disc, you’ll get a pretty good idea of what I got to hear in Toronto, with the supporting live tour representing a goodly portion of the setlist, and sound. Columbia, her long-time label, didn’t want to release it. Instead, it was issued independently (and unfortunately with a bad cover to boot), and sometimes tends to get left of out her discography, perhaps seen as a routine live stop-gap. That’s a real shame, because it sports seven new or non-album songs, some re-arranged — and improved — latter-day numbers plus some new covers, leaving Bottom Line as essentially an album of new material, recorded live. In fact, I feel that the two best titles of her post-1971 output are the two live discs: At The Bottom Line, and the even better Season of Lights from the 1976 tour. I tend not to be a big fan of live albums, but this is one of those rare occasions where a particular artist at a certain moment fared better when recorded by, arranged for, and delivered via a live unit. For me, the definitive version of “And When I Die” is the languid, jazzy arrangement from Season of Lights, her 1977 LP recorded during the 1976 Smile tour. Many of the new numbers were part of tonight’s set, and I was surprised and impressed by there being that much fresh material, in particular “The Japanese Restaurant Song,” a humorous offering, recapping the mirth and frustration involved in family dinners out (“One of the new songs I really liked was something about a Japanese restaurant — it details what she’s been doing lately … Some great lines in the song.”). 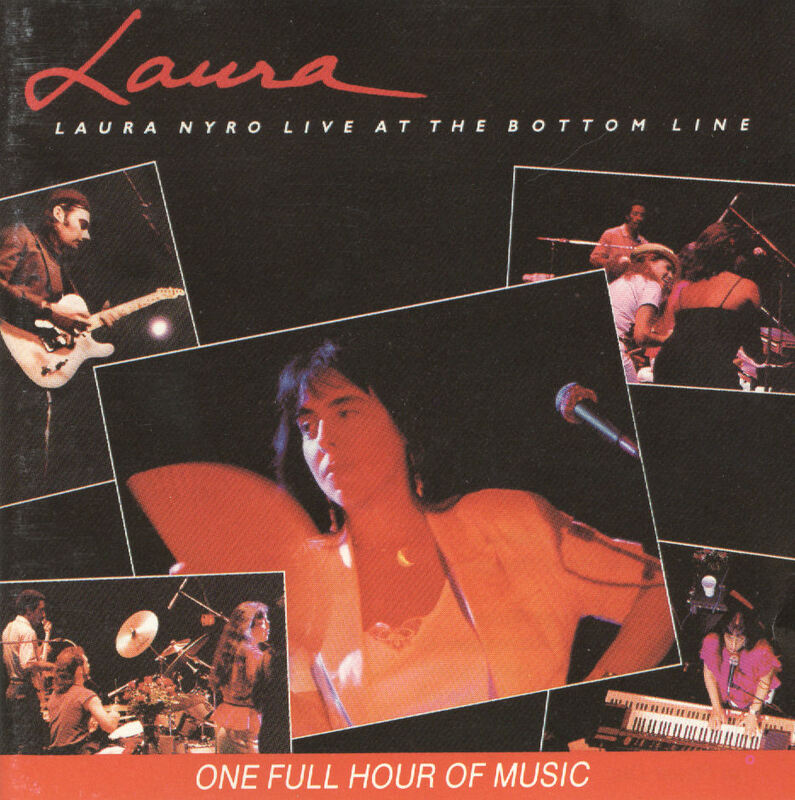 “The Japanese Restaurant Song” from Laura Nyro Live at the Bottom Line, recorded in 1988. Of course, she treated her fans to plenty of her best-known songs as well, including “Emmie,” “Timer,” “Time and Love,” and a solo “And When I Die,” while “When I Was A Freeport and You Were the Main Drag,” was a particular highlight for me. And “Stoned Soul Picnic”: Such an apt title for how intoxicating Nyro was live. She was one of those performers who seemed to really go to a place outside herself while on the stage, emitting that transportive vibe to her audience via song. Keith and I were both completely sober for this show but were so mesmerized, the music and experience functioned like a drug. For instance: she closed out the evening with a solo cover of “Dedicated to the One I Love,” and near the end, hit and held a note so intense, so pure, so emotional, that Keith lost it, unconsciously bleating out a verbal exhalation, so completely given over to the moment was he. After the show, over a late night bite in Chinatown, he couldn’t thank me enough for having talked him back in to going, so blown away was he by her performance. 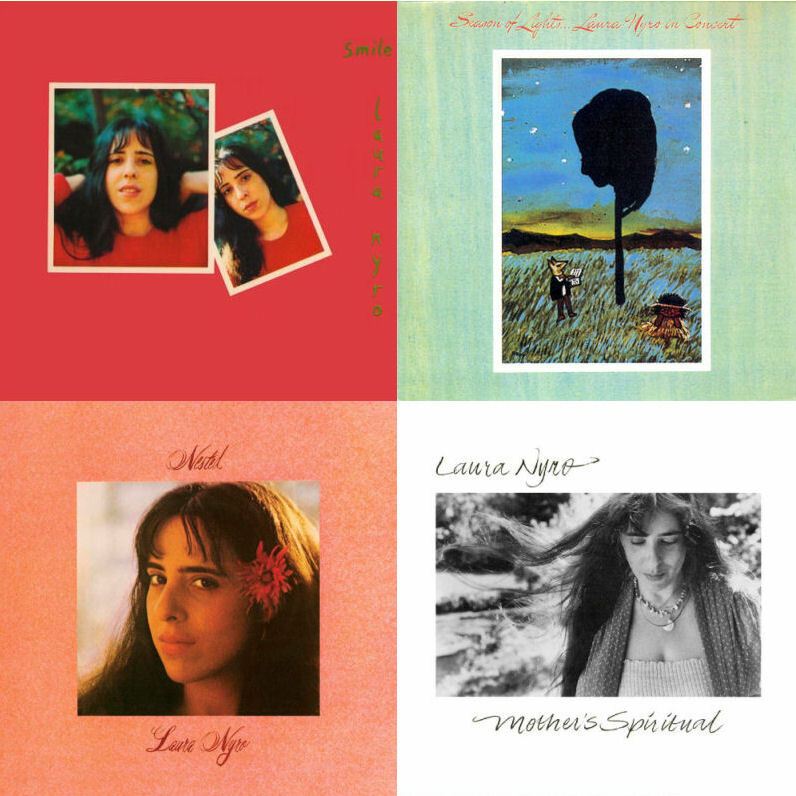 Nyro’s Final Three Discs: Walk the Dog and Light the Light (1993), the self-curated Stoned Soul Picnic 2-CD Best Of, and Angel in the Dark, covering her final recordings from 1994-1995. For those of us there on that night, we wanted and got our “Wedding Bell Blues” and “Stoned Soul Picnic.” And the charge of Nyro’s electricity, which we carried back out onto the steamy July Toronto streets. Laura returned to regular live performance for the next several years. This concert was the only time I ever got to see her live. 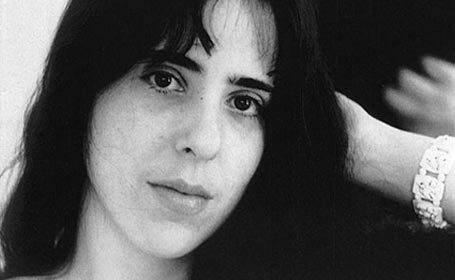 Laura Nyro died of ovarian cancer on April 8, 1997. It was the same disease that had taken her mother’s life, and at the same age. She will be inducted into the Rock and Roll Hall of Fame on April 14, 2012. Yep, I can surry: “Stoned Soul Picnic” from Eli and the Thirteenth Confession (1968). Next On Stage –> My look back at Ottawa Bluesfest 2010 picks up again with a highly anticipated set by the Arcade Fire, shortly before the release of The Suburbs. Great post here. I photographed LN for a Toronto Publication once just before the Toronto show. Regrettably, I did not know very much about her. We had a great photo-shoot and that evening when I went to her concert I was just so amazed at all the songs I knew of hers and did not know it was her who wrote them. This brings back so many memories and your post here gives a lot of fine insight I did not know until now. V.A. ~ This is a gem; maybe, to me, your best. You’ve captured Nyro completely (to my ears, anyhow), putting into words how I felt when I listened to my own records (“Eli and the Thirteenth Confession” and “First Songs” in that Bleecker St. tenement I lived in @1972. Your writing is so sharp and descriptive: “At its most potent, her music is a hypnotic synthesis of, and battle between, forces of light and darkness, with neither grabbing the crown for long — particularly light.” Your analysis of her influences and sources, your descriptions of her sound and effect on you (us!) is nothing short of masterful. 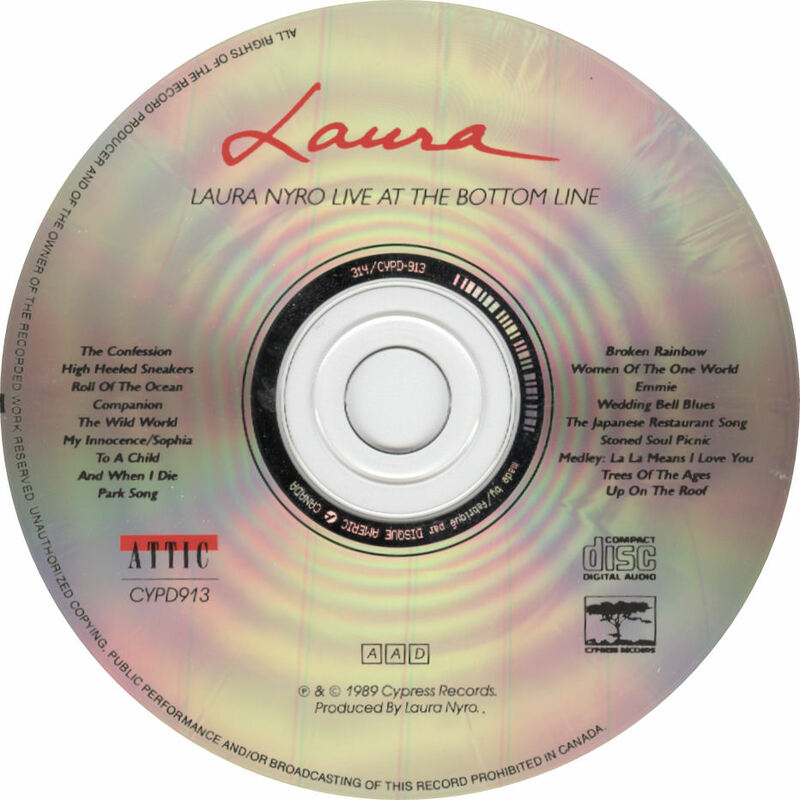 I never saw her, but went to a tribute concert@1997 and have a CD from the all-woman roster: Time and Love, the Music of Laura Nyro. Maybe you have it? Phoebe Snow does the title track, and Jane Siberry, Suzanne Vega, etc. perform. Thanks for giving us the “Full Nyro” here…now off to play my scratchy records! Incredible post, VA, and passionate tribute to Ms. Nyro. Have you considered writing a book about her and/or other artists? 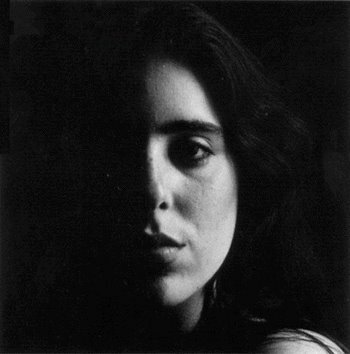 I’ve loved Laura Nyro ever since I saw her live in Champaign, Il in the early ’70s. When I play her CD’s at the store, people always ask who it is. Nice post. I think I’ll play her again today. ‘Bout bloody time she’s inducted. First version of “When I Die” I heard was kind of insipid (well, Peter, Paul and Mary). It was only when I heard her version that I really got it. As always, fascinating reminiscences, VA.
Nicely done! I saw Laura Nyro in Ann Arbor on a double bill with the Fifth Dimension and was mesmerized. A couple of months ago, I went to ITunes and re-bought everything they had. God, what a sound. VA, thanks for another wonderful look back in time with a very talented artist who, unfortunately, is no longer with us. I am impressed by your keeping written notes along with all of the records and the cassette. Such an interesting story related to the concert–before, during, and after! I don’t happen to have any of her records here, but I do subscribe to Rhapsody and noticed they have what appears to be all of her albums online. The 5th Dimension’s version of “Wedding Bell Blues” is one of those very memorable songs of my youth and it had a ton of airplay in the NY metro area. (WABC-AM back at that time in the ’60s was the station I listened to the most.) That she died from the same type of cancer and at the same age as her mother is very sad and also eerie. Algis: Was it for NOW, perchance, that you took the photos? I know that I still have the NOW cover issue and article from the week of the show, but unfortunately couldn’t find it to scan in for this piece. I know that Laura played Toronto again, about a year or so later, but I’m wondering if this July 1989 set was the show you were at as well. That would now make for 2 shows we were possibly both at. dirndl: Thanks for your high praise, especially coming from a fellow Nyro fan. I know the concert and CD of which you speak, and that’s wonderful you got to attend. So glad you enjoyed this and thanks for the kind words — and I hope you’ve enjoyed the scratchy records today (I’ve been listening to Nyro obsessively all week while putting this together). Erica K: In terms of a book, I started this writing project partly to see where things may go, with a book being one of the long-shot possibilities. Time will tell. Thanks for stopping by. jlsathre: How cool is that, seeing Laura in the early 70s! Hope you enjoyed some Nyro today. Boanerges1: Damn right it’s about bloody time. I knew that PP&M covered it, but haven’t heard it. In putting this piece together and grabbing the links for all the hit covers, I realized that I really dislike the BS&T version of “And When I Die” — easily my least favourite of the big hit covers. nilesite: Now that’s something, seeing them on a bill with the 5th Dimension — each act really lined the others’ bank accounts. While I definitely prefer her originals, I think that the 5D did the best job covering her material, back in the day. I love what gets termed these days as “Sunshine Pop,” and they fall under that umbrella. designanator: Yes, both very eerie and very sad. I can still see myself in my old apartment, reading about her death on a sunny spring morning (15 years ago this week) and being supremely bummed. As for those notes … it’s going to be a lot of fun writing this series once it catches up to my “journal” years, starting in the later ’80s, and being able to tap into that resource. Catch-22: It was indeed incredible what she did with that voice, not to mention that striking face and eyes. … And I miss being a DJ. She was a remarkable talent alright. While I didn’t follow her music much, except through the many covers, I’d once thought her similar to Carole King. But I think Laura had some extra quality. I don’t know if the right word is depth, authenticity or soul, but it’s something like that. As for her own performances, I’d blogged about musical imprinting and she is one of the prime examples. I’ve heard and enjoyed the 5th Dimension and the BS&T versions so many times before I heard hers that much as I enjoy them, I’m wedded to the ones I first heard. The Bitter End has quite the pedigree. My favorite pre-Dylan folk album is the Chad Mitchell Trio Live at the Bitter End. If you haven’t heard it you must seek it out. And oh those yahoos who bellow for the favorites. There’s one at every concert. Great piece of writing Various. You really put your heart into this one. Nyro comes from a period where a handful of great writers with personal visions somehow got to be succesful pop songwriters. Well done tribute to her, glad she’s getting a well deserved induction! Hear you about BS&T. I was never a big fan, although I admired the musicianship. They were just too … dramatic, I guess. The PP&M album was called “Album” (1966). Also included: “For Baby (For Bobby”) and “Well, Well, Well”. I still have it somewhere. And @Abra? I lurve me the Chad Mitchel Trio. Their versions of the “Twelve Days of Christmas” and “Lizzie Borden” still make me laugh. Abra: I agree with you re: the Carole King analogy — and Nyro was a big fan of the Goffin/King songs, with her only Top 40 single being a cover of “Up On the Roof.” Carole’s career is probably the one *closest* to Nyro’s in similarity, from a creative perspective, as well as place and time. As for that extra quality, in a single word, the one I would use is “magic.” And I can understand people’s attachments to the originals, but for me, some of them — esp BST doing “And When I Die” — I just can’t get into. The 5th Dimension versions I can certainly enjoy, though. The live album was at the Bottom Line, but the close-sounding Bitter End was a pretty famous venue too and I’m sure Laura played there at some point. You’ve mentioned that Chad Mitchell album before, so I will definitely seek it out. As for the yahoos, it depends on the type of yahoo. For me, some of those unscripted elements are what makes the live experience unique and memorable. I actually thought it was kind of funny, and I don’t think I could portray the tone in her voice that delivered the “Don’t Ask.” As I said, it depends. Thanks for the kind words, Abra, and glad you enjoyed. Kevin: This was also a time when “innovation” could sometimes even be commercially rewarded, another rare concept. Thanks, Kevin, and I too am glad to see Laura get this recognition. Boanerges: I just watched a few PP&M performances of “And When I Die,” and I Love their cover of it. That actually may just be one of the very best covers I have heard of a Nyro tune, so thanks muchly for that tip. Various: Wanted to let you know I came, I saw and am still digesting and listening, and thanks to you … learning. Scarlett: I’m happy to be of any service in keeping Nyro’s name and great body of work out there. Hope you’re enjoying. Well Various, I’m back. Regarding Nyro: I had heard her name but did not know her music (or so I thought). Now I see all the writing she did for other performers. Wedding Bell Blues, (hey, I’m not crazy about the theme of the song) is a great pop song. Poverty Train at Monterey, now that’s a piece of herstory. Nyro is beautiful in person and voice, thanks for teaching me more here. Today she is being inducted at the RnR Hall; a decade and more so late. Wish she had known. Now, you’ve got me curious — which Alice song did she write? Btw, I was at that Steel Wheels show at the CNE in ’89. From where I sat Jagger and the Boys looked to be about six inches tall! Scarlett: I don’t think Alice Cooper ever recorded a Nyro song, but he has talked about being a fan of hers on a few occasions. Glad I help spread the word on Laura. Re: that Stones’ Steel Wheels gig in Toronto — finally, there’s a show we were both at. I knew that had to happen at some point. It’s going to be a fun, eventful one to write about when I get there — even more so, getting to see Keith Richards pretty up-close’n’personal in Detroit. 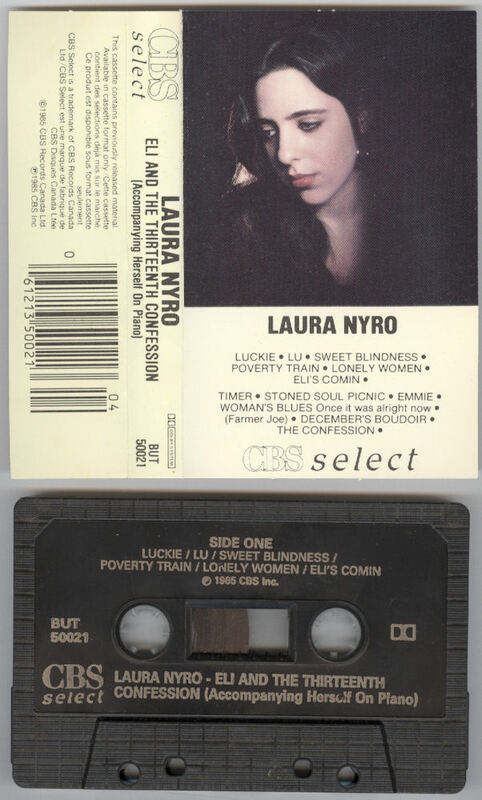 This entry was posted in 1960s, 1970s, 1976, 1980s, 1989, 1990s, Canada, Concerts, Live, Memoir, Music, Ontario, ticket, Toronto and tagged 1989, Canada, concert, july 15, laura nyro, live, music hall, My Life -- In Concert!, Ontario, rock & roll hall of fame, rolling stones, saturday, stoned soul picnic, tickets, toronto, various artists, variousartists on April 14, 2012 by VariousArtists.